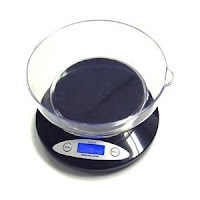 One of the most under-utilized tools available to home cooks is the digital kitchen scale. These cool little scales are available at a great range of price points...some even starting at $15 or so. Without sounding too obvious, digital scales serve the purpose of helping you measure your ingredients by weight...rather than volume. Why is this important, you ask? Think like a pastry chef. Most baking is based upon reactions that cause a chemical change in your ingredients as they form your final product. As the cooking process takes place, those ingredients react together and are completely transformed; they can't ever be separated again. Great baking recipes, and great chemistry, require precision. Most home cooks have learned to differentiate between wet and dry measures for their ingredients...i.e. a liquid measuring cup versus 1/2 cup or 1/4 cup scoops for dry components like sugar or flour. But, once you advance to more challenging and intricate recipes, you may find that the dish calls for a certain number of grams of sugar. A digital kitchen scale allows you to make those precise measurements by weight...as specific as the 1-gram graduation or better. Here's a Digital Kitchen Scale by American Weigh. It has up to an 11-pound capacity and a removable bowl- very convenient for home-based baking. Digital scales are great for portion control too...but then again, it's the holidays and who wants to think about that? PS-If you know about a locally-owned business who sells this or other items on our list, please leave a comment below so that we can support local business owners!